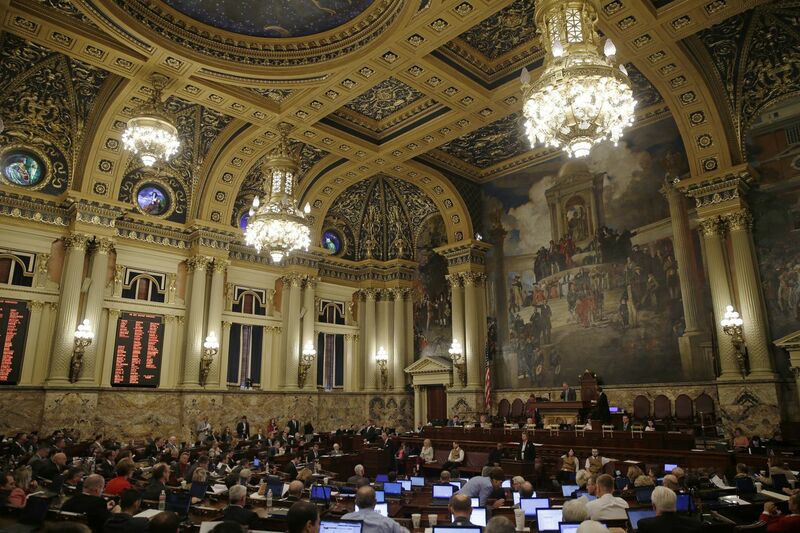 Pa.'s legislature is ready to start a new two-session. Another season, another reason to wonder what the Pennsylvania legislature might do — or not do. If you’re like most citizens, you’re no doubt (cough) dying to know what lies ahead in the 2019-20 session. After all, so much change: 50 new members; more Democrats; lots more women, the most ever, now making up 25 percent of the 253-member General Assembly. Exciting times, no? Harrisburg will never be the same. It’s still a boys’ club. It’s still Republican-run. With Democratic Gov. Tom Wolf headed to a second term, we’ll still have split government. GOP majorities in the House and Senate are more conservative than last session. And they’re starting out in usual fashion. Sworn in last week. Off this week. But, hey, there could be fun ahead. Let’s look at reasons why. The lieutenant governor-elect, with his Harvard degree, his huge proportions (6 feet, 8 inches tall, 260-something) tattoos, trademark work clothes, and shaved noggin, gets to preside over the stately Senate. I’m thinking he won’t need a gavel. And it’s probably coincidence, but the Senate, where tradition calls for men to wear jackets and ties (and women to dress professionally), just adopted a new Senate rule mandating such attire. Too bad. The visual of Fetterman in his normal garb standing at the dais procedurally running the show would have been stunning. Still, the fact the Democratic straight-talking, uber-progressive, soon-to-be-former mayor of Braddock is so stylistically and ideologically apart from most who serve, or even visit, the upper chamber holds at least rhetorical possibilities. Fetterman (and Wolf) take oaths of office Jan. 15. By the way, Fetterman, when asked, always said he’d abide by Senate dress tradition. Speaking of dressing, GOP House leaders appear to be girding for battle. Yep, they’ve created a new committee, the House Government Oversight Committee (or, as I’m calling it, the House Search and Destroy Committee), with broad authority and subpoena power to investigate what it wants. That includes the governor’s office and the independent row offices — attorney general, treasurer, auditor general — all held by Democrats. Hooray, more government! More expense. More chances for partisanship. More opportunity to litigate separation of powers. And, of course, more redundancy. The legislature already has 47 standing committees with oversight. The House already has subpoena power. Democrats question the new committee’s intentions and note the House has added extra session weeks (more time for high jinks?). Republicans say not to worry, it’s good government, not politics. So, let the games begin. In other news, the legislature’s most controversial committee chairman of late, Rep. Daryl Metcalfe (R., Butler), is being moved from the House State Government Committee to head the House Environmental Resources and Energy Committee. Metcalfe, known for blocking or gutting redistricting reform efforts, hating the idea of a (much-needed) constitutional convention, holding annual gun rallies on the Capitol steps and, famously, objecting to being touched by a male colleague because, “I am a heterosexual,” says the move is his choice. Redistricting reformers Fair Districts Pa. expressed thanks for the move. But the statewide environmental advocacy group PennFuture issued a “cause for concern” statement. Still, expect scrutiny. Hey, from maybe that new oversight committee. Finally, if you’re wondering about hot issues rejected in the past — hiking the minimum wage, extending statutes of limitations for victims of child sexual abuse, redistricting reforms, gun-safety measures, voting reforms, gifts bans, requiring receipts for member expenses, severance tax on natural gas — don’t. The “new” legislature, ideologically, is pretty much the old legislature. Which is to say that absent some monumental deal-making, it’s more interested in extending its oversight power (and proper attire) than in real reform or progressive change to better serve the state.